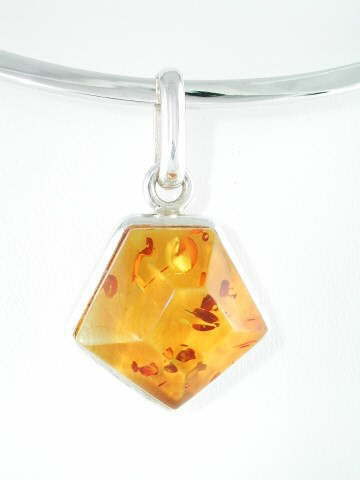 Small faceted pale cognac Amber pendant set in 925 sterling silver frame mount. Although not a crystal (it is actually fossilized prehistoric tree resin) Amber is widely used in crystal healing because of its beautiful, sunny, uplifting energies. It has a strong connection with the Earth and is a powerful chakra cleanser. It has been worn to help relieve tension headaches and to relieve arthritis. In some Far Eastern countries Amber is referred to as the ‘Tiger Stone’; the stone which carries the soul, and therefore energies of the tiger; promoting courage and strength. Although most often thought of as being a golden, yellow/orange in colour, it can be found in a gorgeous creamy colour (sometimes referred to as Butterscotch Amber), deep reddish orange (Cognac Amber) green and also rarely, black. This Amber originates from the Baltic.